National Bittersweet Chocolate with Almonds Day is an opportunity to celebrate the sumptuous combination of chocolate and almonds. Nearly 40 percent of all the world’s almonds end up in some form of chocolate, most often a candy bar. The pairing is one of the oldest known recipes using chocolate. While National Bittersweet Chocolate with Almonds Day, held on November 7, is sponsored by the National Confectioners Association, it’s primarily an online celebration involving dark chocolate and almond lovers. The federal government, recognizing the nutritional value of chocolate, added it to the meal rations for U.S. troops. The U.S. Cocoa Exchange opened in New York City to facilitate cocoa transactions. Hershey's Mounds bar, made with almonds, coconut, and dark chocolate, hits the shelves. This made chocolate accessible to more than just the upper class. J.S. Fry and Sons, a British chocolate maker, devised a way to turn cocoa into a solid bar. Buy a nice big bar of dark chocolate along with a jar of almonds to make your own dipped almonds at home. You might add a teaspoon or two of cornstarch to thicken the chocolate sauce. Sprinkle them with some sea salt to add extra flavor. You have plenty to choose from! You've got Hershey's Special Dark with Almonds, or a Mounds bar, which includes shaved coconut (Mounds' sister bar, Almond Joy, features milk chocolate), or the Dove Silky Smooth Promises Dark Chocolate & Almond. The kids will love you for it! There's Hershey's in (the obviously named) Hershey, Pennsylvania. You can also hit the theme park next door. The Sanders and Morely Candy Makers chocolate factory in Clinton Township, Michigan offers a free tour, as does Hammond's Candies in Denver. Experiments on rats have shown that the fat in cocoa is actually less fattening than the fat in other fatty foods. Research shows cocoa works as an anti-inflammatory agent in humans. Consumption of cocoa thins the blood and improves circulation to the brain; it's thought to improve vision as a result. Dark chocolate, in particular, contains antioxidants that actually can improve the condition of your skin. Dark chocolate contains fiber and offers all of the health benefits that fiber brings, including satisfying your appetite. The origins of combining dark chocolate and almonds are unknown, but whoever did it knew what they were doing. There's something about the taste and texture of almonds that just works alongside the bittersweet taste of dark chocolate. Believe it or not, it's healthy! While there's plenty of fat in dark chocolate-covered almonds, health benefits do exist when eaten in moderation. 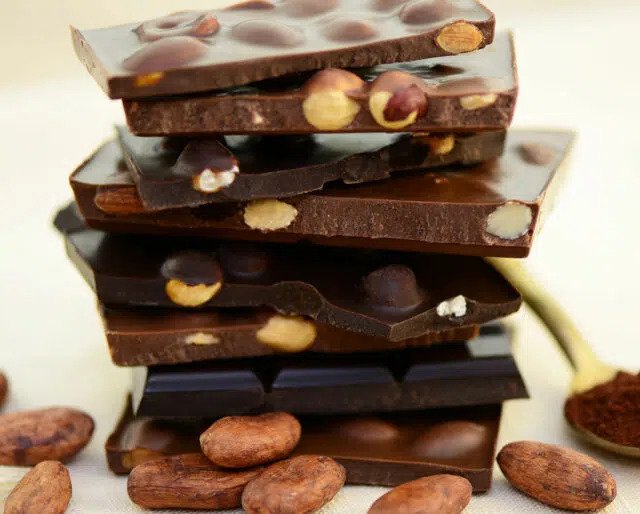 The antioxidants in dark chocolate, combined with the vitamins and proteins in almonds, offer a snack that can help reduce cardiovascular disease. The U.S. is the world's largest producer of almonds, and the majority of production happens in California. One Sacramento plant churns out more than two million pounds of almonds each day.